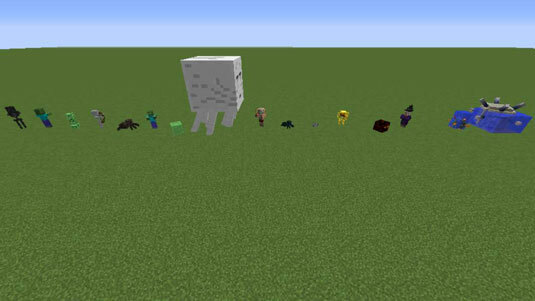 Hostile mobs cause most of the danger in Minecraft: They attack without provocation. However, hostile mobs tend to provide especially useful loot. The table describes hostile mobs in detail. construct known as the Blaze provides a useful item, the blaze rod. that can’t get hit by the blaze’s fireballs. Cave spider The poisonous cave spider lurks around abandoned mine shafts. can’t blow up stone blocks. bounces like a spring. It splits into smaller cubes when killed. slow, so it’s easy to stay away from them or kill them. Silverfish A silverfish is a nipping bug that burrows into stone. wait for them to come to you! dying. Slime is very weak and easy to kill. a roof over your head, or keep your distance. of regeneration to heal and uses potions to mitigate fire damage. She throws potions of weakness, poison, slowness, and harming. physical object so the witch can’t throw potions at you. fast as you can, attacking, and getting away. the wither with 4 blocks of soul sand and 3 wither skeleton skulls. skeleton, keep 2 blocks above or below you and the wither skeleton. can easily fight them from above or below. fight them the same way as the zombie. will usually incur damage in the process! fight. The only way to get around them is to fight them! yourself from endermite is to just kill them.